The new series of video works by Song Dong on view at Pace Beijing continue the artist’s playful experiments with impermanence and the illusory nature of everyday objects, but are ultimately a let down due to lackluster installation. Pace Beijing has devoted a large section of their space to showing these four new video projections. Arranged asymmetrically, one on each wall in the large darkened space, these short videos begin with artful arrangements of foodstuffs in tableau that hark back to traditional Chinese landscape paintings or shanshui penjing 山水盆景 (tray-based arrangements of materials representing idealized landscapes). In Song Dong’s case strips of smoked salmon or a butchered pig make for fleshy terrain; cut fruit, green peppers, or broccoli stand in for verdant hills and shorelines. Over the course of the videos various tragedies take place in these worlds. Hands from above wield knives, choppers or blow-dryers, and proceed to aggravate the landscape, toppling the parsley trees, slicing the fruit and meat formations in their destructive rampage until all is laid waste and we are left with the raw materials stripped back. But in the same way that the micro is initially interpreted as macro—foodstuffs as landscapes—we feel the urge to remap these interventions as natural phenomena, tsunami, earthquake, or war. Song Dong’s work has consistently dealt with this urge, confronting these delusions of fixed meanings through various tactics. Works such as "Breaking Mirror "(1999), "Crumpling Shanghai" (2000), and "Burning Mirror" (2001), each present an image of reality destroyed in the manner indicated by the titles, physically exposing the image for what it is. 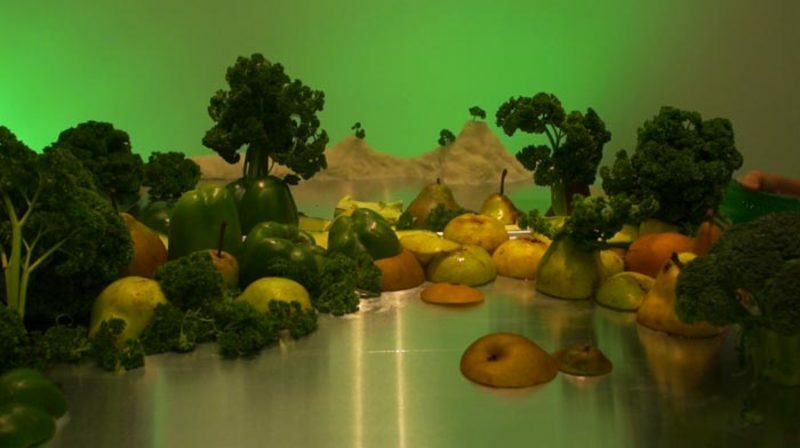 The new works are a continuation of a series that takes food as its subject, either in videos such as "Eating Landscape" (2005), where a fish-head vista is picked apart by chopstick-wielding hands, or large-scale installations of cityscapes formed of sweets and consumed by the audience over the course of the exhibition. An interesting counterpoint to the works at Pace Beijing is fortuitously on display at Beijing Center for the Arts this month in the group show “H2O.” "Touched 100 Years" (2010) presents 100 small monitors each showing a well-known photograph from world history, one for each year from 1910 to 2010. Every so often a hand brushes across the photo, disturbing the surface and revealing it to be a layer of water between the photograph and camera. The hand disappears off-screen, the water settles, and once again the photo is clear – but the clarity of the image and the ability to gain knowledge through touch has been thrown into doubt by this simple gesture. Whereas "Touched 100 Years" presents the image as a point of return interrupted by the process of disruption, "A Blot on the Landscape" offers no such restoration of the image. The installation of "Touched 100 Years," with its floor-hugging chain of videos snaking around the walls of the gallery feels entirely appropriate to the extent of the piece – something that unfortunately cannot be said of the installation at Pace Beijing. It’s difficult to see how the four video projections of "A Blot on the Landscape" successfully occupy the amount of space they are required to fill. It is as if the installation feels it must make up for a lack in the works themselves, which may indeed be the case as these are only modest developments over Song Dong’s previous works. I feel this conflict between the arrangement and the works detracts from the overall experience, diluting the works. The weakness of the installation is mirrored in the weakness of the wall text introducing the works. This “Preface”—in pride of place as the contextualization for the works within the Gallery—seems to bear little direct relation to the works on display. Ultimately textual vagueness and contradictions, coupled with a weak installation do the artist and his works little service.